By Mohammed Amer Morgahi. 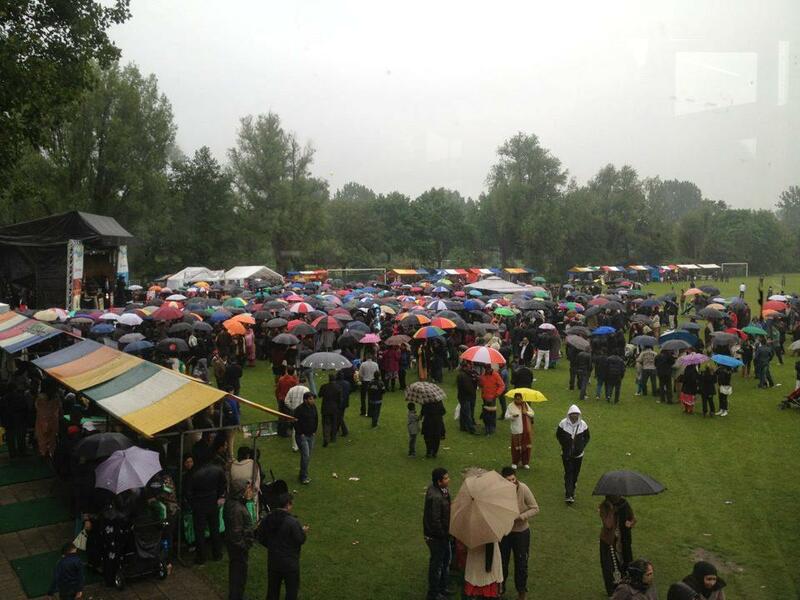 In the month of June it was an unusual rainy day in Amsterdam, however a large number of enthusiast Pakistanis assembled at the ‘Pakistan Mela’. Unusual was also a significant participation of women, young and old, and children in the event. People had come not only from different parts of the Netherlands but also from the neighboring Germany and Belgium. In the gray and damp Sloterpark the smell of Pakistani food and music was covering the whole park, as were the colorful umbrellas of the participants. The word ‘Mela’ or ‘gathering’ or ‘festival’, is a Sanskrit word and it deals with the festivities or gatherings around the Sufi shrine and Hindu temples in South Asian villages. With urbanization it also got more secular usage, and among the South Asian diaspora communities it turns out to be an important cultural import. Thus you have Indian, Nepalese, Sikh and Pakistani versions in major cities of the UK and North America, and so the Pakistani Mela in Amsterdam als took shape in the last couple of years. The Pakistanis in the Netherlands are a small group that mostly lives in three major cities: Amsterdam Rotterdam and the Hague. Following their area of origin in Pakistan, their different migration history and their scattered existence in the Netherlands it is difficult to speak of a single ‘Pakistani community’: the ‘people of Gujrat’, settled in the Hague, with their cast or biraderi base links have least in common with the bulk of Memons from Karachi living in Amsterdam. Similarly the fortune seekers migrated in the 1970s are of different orientations than the asylum seekers of 1980s. However experiences in the Netherlands through religious and social gatherings, the emergence of some youth groups that look for common boundaries and the emergence of in-group marriage patterns among the Dutch Pakistanis show tendencies towards materialization of a single community. The organization of the ‘Pakistani Mela’ should also be seen as a step in that direction. Like elsewhere the Pakistani Mela in Amsterdam exhibited stands with a wide variety of Pakistani culinary, women dresses, henna paintings, books etc. Besides some traditional sports like Kabaddi, a musical program was arranged, a famous Pakistani female singer was invited, in addition to many local Pakistani and Indian musicians. From food to music and other aesthetic styles exhibited, the ‘Pakistani culture’ cannot be thought outside of the wider South Asian cultural mixings. A Pakistani dress show with peculiar party and marriage dresses by a local boutique shop depicted, for example, the designs and choices of the middle classes in India and Pakistan. Interestingly, almost all of the female models were from the Surinamese origin, which shows certain conservatism of Pakistanis with regard to the social role of their own women. These cultural similarities were further visible among the participants with many Sikh, of the Indian Punjab origin, and Surinamese who are regular visitors of any Pakistani cultural gathering. The event of Kabaddi—a rural Punjabi male sport exposing body and muscles, was cancelled apparently due to bad weather. The whole event was widely advertised: there were stalls of Dutch entertainers for the kids, and even the VU University researchers in cooperation with the City Council department of health had their stand for a research on the dietary practices of the Pakistani. It shows an increase of interest in what would otherwise be a ‘hidden’ Pakistani group in the Netherlands. The host of the musical program was keen on announcing the names of the sponsors, and even once she got a big boos from the audience when she interrupted the music event for this purpose. However these sponsors were also important for establishing such a Mela. Going through some names of the sponsors like ‘Taste of Lahore’, ‘Sahil Cosmetics’, A. F. Toko’, shows the development of a segment of entrepreneurs among the Pakistanis in the last twenty years. Besides their representation in catering business, the Pakistanis profited from developments in telecommunication and liberalization of cab companies. According to some studies more than 70% of the telephone shops, belwinkels, in Amsterdam are run by Pakistanis; similarly they have quite a share in the emerging business of cab-companies— in Rotterdam they are stereotyped as ‘Taliban Taxis’, following their competition with other groups. These emerging entrepreneurs with different backgrounds were brought together under patronage of the Pakistani embassy to organize the Mela. More than their common Pakistani heritage, a common factor among them was that they had established themselves through their businesses and networks within Dutch society after an uneasy migration experience. But their personal ambitions are usually creating hurdles in joining hands for some common cause or shaping the contours of a ‘community’ with diverse people and belongings. Thus it is seen that the personal ambitions of the ‘leaders’ lead to the emergence of different factions and groups in different Dutch cities. The communal politics of Pakistanis revolves around the competitions of these factional groups and figures. For the moment the ambassadorial interventions are needed to create the events like the Pakistan Mela that provide a diverse ‘community’ some common platform. At the same time through these events these migrant groups are finding their ways and personal means to create space for themselves and to register their cultural practices within the Dutch society. M. Amer Morgahi is external researcher at the SCA department at VU University. He is interested about Islam in Europe, multicultural issues, Pakistan and Pakistani migrants in Europe. Read also his earlier posts on the war against terror, politics of names and 60 kilometers from bin Laden. back the favor?.I am trying to in finding things to improve my website!